Quite sudden and shocking, really. He was only 62-years-old. He was Tweeting himself just two days ago. Nothing on Twitter yet from Phil Liggett. He must be absolutely heartbroken. I long felt—and was very vocal about my belief—that both P&P should've been run out of town in the wake of Armstrong's demise, and it would hypocritical for me pretend otherwise now. But I have to feel for Liggett. This must be tremendously difficult for him. I could still enjoy Paul sometimes when he was doing broadcasts with just CVV, and as much as I felt he had long ago become too much a cliché of himself, I always respected his background, and his multi-lingual abilities. Nothing from Lance yet either. This is very recent news with little to no details yet. It's very sad, no doubt. A very heartfelt and touching tribute from Matt Keenan. I have moved these posts into their own thread. I've always been fond of this particular moment in cycling history. One of P&P's finer moments. Liggett befriended Sherwen as the latter launched his career as a professional cyclist, moving off to France and serving mostly a support rider, or domestique, for bigger talents. Liggett thinks this is one reason why Sherwen became a great commentator—if cycling is, as the saying goes, a sport of “stars and water carriers,” Sherwen was a water carrier, someone who understood not just the glory of cycling, but the humility of it. (He got the nickname “Climber,” because he wasn’t much of a climber.) It made him empathetic, a listener as well as a talker. Lately, Sherwen had been bicycling more. Liggett said he’d heard Sherwen had ridden nearly every day with commentator and former pro Bob Roll while they called the Vuelta a Espana race in September. Sometimes he would call Sherwen in Uganda, and Paul would be on his stationary trainer, riding around English roads on the cycling simulator Zwift. Here is one of the more humanizing articles that I've come across. A very personal insight with some interesting details about Paul Sherwen's life, including some wonderful photos. His death was sudden and unexpected; the cause of death has been ruled as heart failure. He leaves behind a wife, Katherine, and two children, his son Alexander and daughter Margaux. On Sunday I'll go through the same routine I've gone through a thousand times. I'll wake, I'll read over my notes, and then I'll head towards the commentary booth to prepare for the Down Under Classic – the traditional curtain-raiser to the Tour Down Under. Only one thing will be different, only one thing won't be the same, and while I know what it is, and how I feel about it, I don't know if I'm ready. 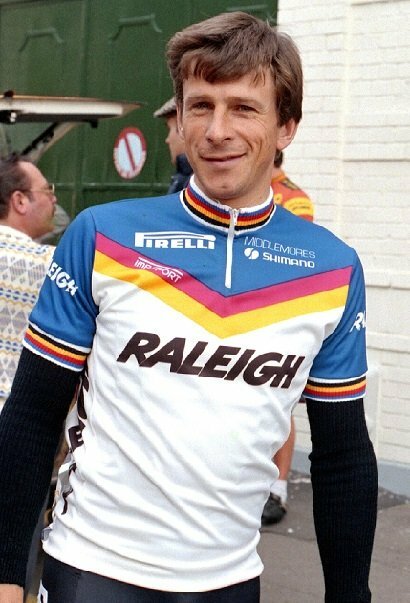 You see, for the past 35 years I've gone through that routine with my friend, my brother, Paul Sherwen. But when I reach the commentary booth on Sunday afternoon, the chair to my left, where Paul would always sit, will be empty. I'll have the same emotions on Sunday when the race starts and I enter the booth and see that empty chair. I used to complain that Paul's notes and papers would encroach on my side of the desk – about how it would be messy and untidy. This week, Robbie McEwen will join me, and he's an excellent commentator who I have an awful lot of respect for. I'm worried, though, that I'll call him Paul. There was speculation as to whether or not Phil would be commentating at all this year. Maybe he'll use this a "Farewell Tour" of sorts? But we had so many laughs. At races we'd share rooms – not because the budgets were tight, but because we'd lie awake until the small hours and share stories. That's such a rarity because the so-called 'talent' never share rooms. He would tell me all these fascinating stories about his riding days, about Africa and his passions, and I would share everything I knew about journalism. So...what did you talk about after the first night? Just sort of bookending this thread for posterity, although I'm sure a few more will emerge as the season unfolds. It really does seem that pro cycling was but a small fraction of what Sherwen was involved with. Quite the adventurous life, by all accounts. The "majority" of the coverage? Of which races? Surely not the Tour, as I thought they were always on location. And for races such as the AMGEN tour, I was always led to believe the same. And why Connecticut? The only thing here that makes sense is the ESPN headquarters, but ESPN has never had anything to do with cycling. Unless they had some arrangement to use the production facilities there? It just seems odd. The "majority" of the coverage? Of which races? Surely not the Tour, as I thought they were always on location. And for races such as the AMGEN tour, I was always led to believe the same. I don't know it, but I think they were on location for far fewer races than you'd think. This sure is one of the more horrible answers I could find to my annual post-winter "did I miss anything over the last months" question. I just figured that waking up after my winter slumber in February, only to discover that De Omloop is not until MARCH was the worst possible news, and then this. It's quite a thought that the eternal soundtrack to cycling no longer is eternal, as far as the English Dubbed International Cut is concerned. For all the wrong reasons. Man I have bitched, but I bet "you'll miss me when I am gone" will be one of those thoughts cropping up over the next few years, at choice times. P-sans-P. Say it ain't so.